HA NOI (VNS) — Inspectors in Ha Noi have found over 83ha of land across the city that is being illegally used to store construction materials. Hoang Mai District has the highest volume with over 381,300 sq.m, followed by Phu Xuyen Gia Lam, Dong Anh and Dan Phuong. According to Ha Noi's Department for Flood, Storm Control and Dyke Management, there were over 200 areas being used to store building materials along major rivers in the city, but only 31 had been granted licences. In river valleys, natural materials such as stone, sand and peat were also being exploited. Head of the department, Do Duc Thinh, said that illegal sand exploitation damaged the capital city's dyke system. The illegal practice had changed the current of the Hong (Red), Duong and Da rivers, seriously affecting waterway traffic and causing landslides, according to Thinh. Thinh said that sand exploitation tempted some people because it required little investment but offered high profits. In just two hours, a ship could dredge about 100cu.m of sand and gravel from the riverbed, which fetched VND2 million (US$95). Illegal storage grounds threatened the embankments' safety, he said. Inspectors have asked authorities in communes and districts where violations were found to clamp down. However, local authorities said it was difficult to address the problem. They blamed prolonged mismanagement of riverside land which had led to its misuse. Former local administrations had also signed contracts to lease the land out for years, which caused problems for the current administration. Finally, there were no official fines for the trading or storing of non-identified-origin natural minerals. 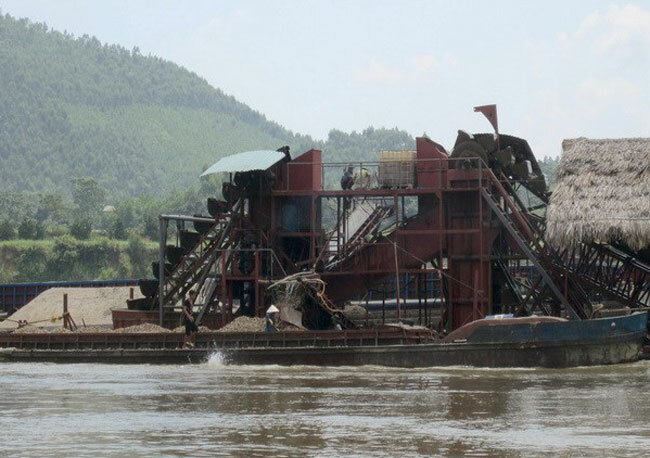 Senior Lieutenant Colonel Nguyen Van Cuong from the city's Waterway Police Department told Ha Noi Moi (New Ha Noi) newspaper that illegal sand miners were smart and transported their cargoes to neighbouring provinces such as Hung Yen and Ha Nam to avoid detection. In the last seven months, the department detected 38 cases and prosecuted seven people for illegal sand mining.